The past several years, own to people’s living standard is improving, there are more and more people choose to riding as their sport. So track e-bikes for sale being a better transportation tool for exercise. The track e-bikes not only can exercise yourself, but also it can be a transportation in your daily life. 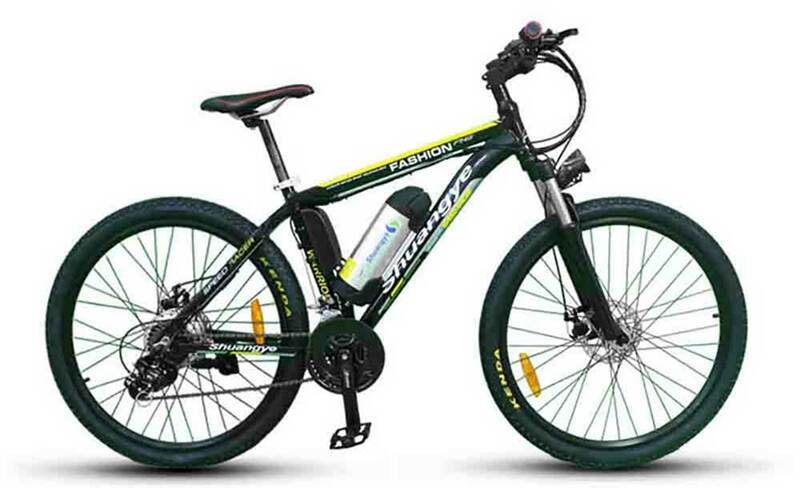 Shuangye A6AB26 track e-bikes for sale are design with 26-inch wheels that made up aluminum alloy. If you like larger size, you also choose 27.5-inch and 29-inch wheels which is more suitable you need. And the track e-bikes for sale support loading 150 kg. In order to meet your requirements, each bike has a thumb throttle and a LED digital display, speed sensor, Shimano 9 speed hub, 160 disc brakes. Under this equipment, I think it would bring you a excellent riding experience. The 36V/48 9AH/10AH lithium-ion battery was designed like a bottle on the frame of track e-bikes for sale with locked, and the charge time is 5-7 hours which is shorter than other track e-bikes for sale. So you can ride 60km or 80km on every charge. And the bottle battery of track e-bikes for sale easy to remove and take indoors when you worry the bottle electric bike battery was stole by thefts. The track e-bikes for sale come equipped with a powerful 36V/48V 250W/350W/500W rear hub brushless electric motor. The motor to deliver power and speed when you need it. Though the track e-bikes for sale are design with a motor, you also can turn it into a non-electric bike when the battery run out of electric quantity or you do not want to use the motor. The max speed is 25km/h~30km/h which will give you different experience. The track e-bikes for sale a Fun, Fast and Rugged ride, and can handle a variety of terrains. User report that the track e-bikes for sale are great for back country roads, coastal trails, as well as urban adventures. The track e-bikes for sale is based on customers requirements to design. You will feel safe and confidence when you ride the track e-bikes for sale. Besides, The track e-bikes for sale frame made up aluminum alloy that withstand more impact than you imagine. And the suspension front fork allowed to adjust 100mm range. The track e-bikes for sale has a LCD pass display that installed in the center of the handlebar, you can know the electric quantity, temperature, speed, motor power and so on. Based on the information, you can adjust your plan. We also have seat quick release which can adjust the seat post depend on you like and need. If you want to more detail information about the track e-bikes for sale, please contact us freely.